Trash Robot is a website for films or videos about robots and the development of robotics inside the home with the help of things like Twitter (@trashrobot. 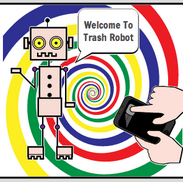 Trash Robot ® ‘Media Marketing Communications’ corporation. A video website for robots, sharing recycling news in and around London UK. Email: sales@trashrobot.com to have your videos hosted here from YouTube or Vimeo. Telephone 07920401194 UK Mobile Number. Address: 1 Chesnut Road, Tottenham, London, N17 9ES. Connect with the links above on social media. Musicians be sure to follow and send a message @trashrobot for reviews and requests to talk at your event email link is in the footer.